Millennium Turn Signal Bar for Harley-Davidson Wide Glide applications fits between the forks and mounts to the headlight mounting bolt. 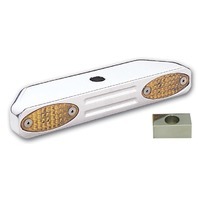 Machined from Solid Billet Aluminum and triple chrome plated. Fits Harley-Davidson FXWG, FXST, FXSTC, and FXDWG models. Includes elliptical amber lenses. Measures 8-1/8" x 3/4" x 1-1/2. Most modern motorcycles will require a load equalizer to properly control the signal action on this Turn Signal Bar.